March has arrived after February's major mood swing. I snapped this photo yesterday of a little boy hitchhiking a ride on his dad's shoulders during a snowstorm. After several inches of snow fell, the temperatures rose and the melting commenced once more. 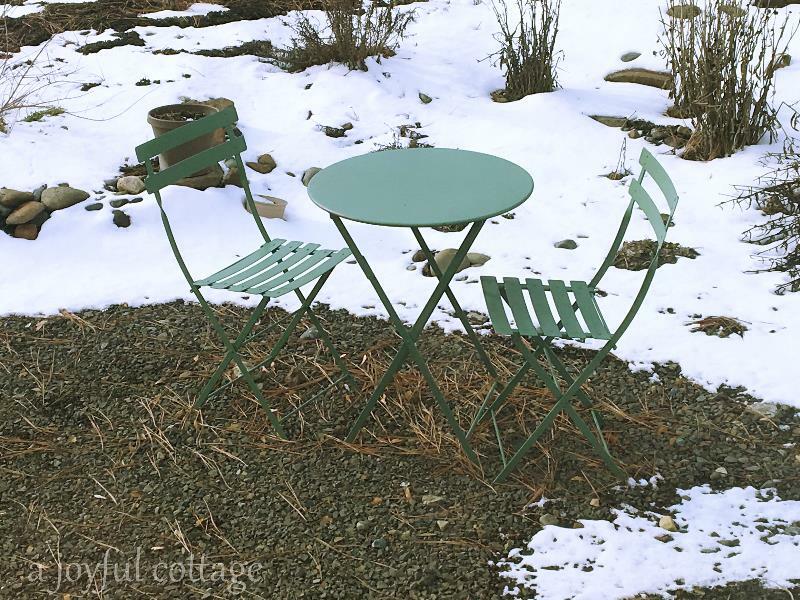 This is my garden this morning, which is pretty much the way it looked before two snowstorms passed through the last two days of February. I noticed a couple of days ago that crocuses and daffodils are peeking through the snow, and that makes me happy. 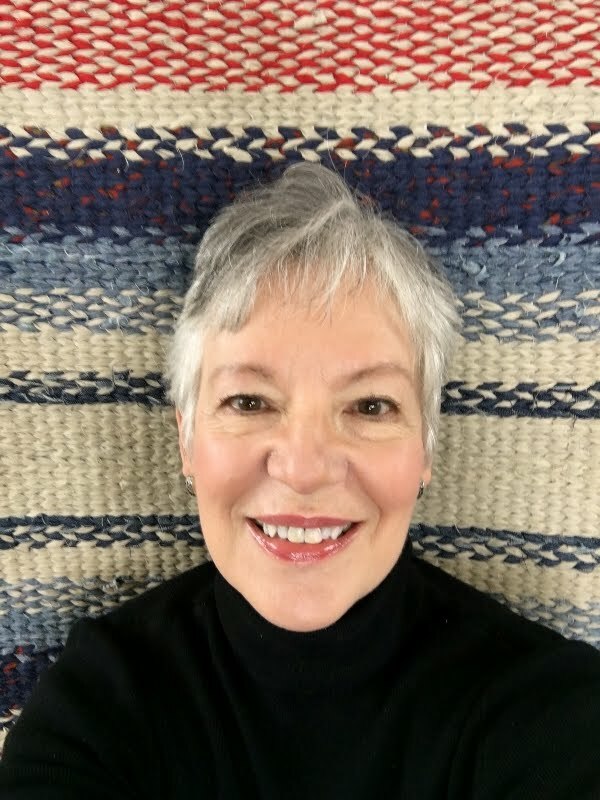 My decluttering adventure continues with periodic breaks for rug making and normal life activities, like grocery shopping and running errands. Here's my rug so far. I really want to get it finished and off the loom so I can start on some collages for the Spring Fling 2017 I'm organizing. It will take place on April 8. This is an artisan/craft fair, similar to the Holiday Bazaar I participated in last December. Since there are no spring events like this in our community, I decided to start one. Fortunately, I've received lots of support from others who have planned similar affairs, and their shared experience is a big help. As I mentioned, I have managed to get more decluttering done. I went through all my magazines and gave away about 30 to friends who will enjoy them and pass them along. I saved only a few of my favorites, which are kept by my chair in the sitting room. Next on my list is papers, a suspected time-consuming chore. I skipped over that and went to my makeup bag, which I knew would be an altogether easier, albeit much needed, task. I dumped out everything in the bag. Honestly, I was kind of shocked at what I found in there. 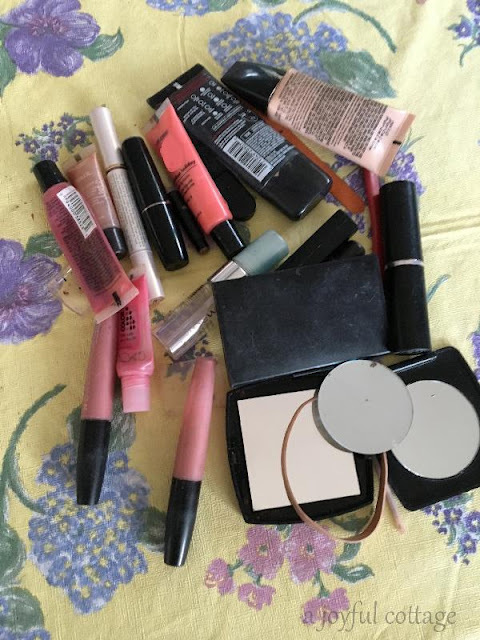 Just keeping it real here, but there were old broken compacts and stray mirrors, lots of makeup I purchased years ago and didn't like, brushes I never use, and even an old rubber band (good grief!). After sorting through it all I came to realize I have 7 makeup essentials. 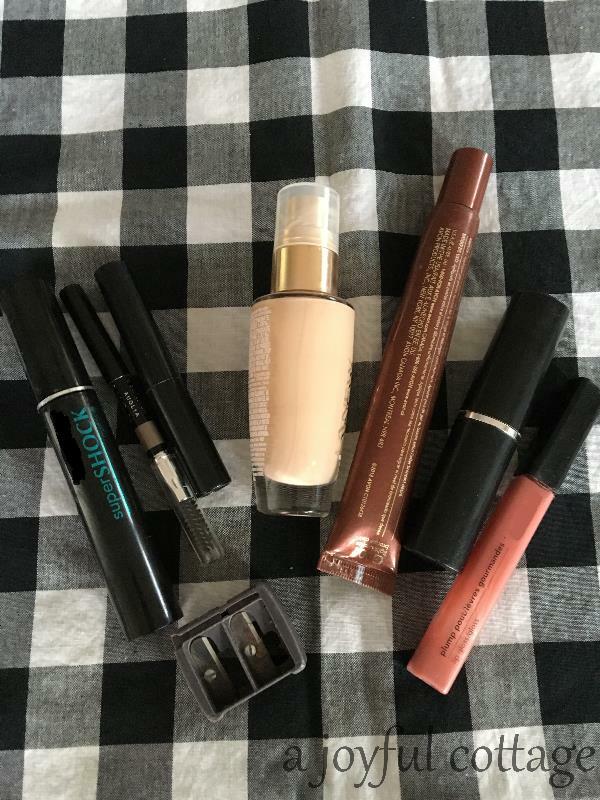 Mascara, eyebrow pencil (and sharpener), concealer, liquid foundation, bronzer (I mix a little with my foundation in the summer), blush stick and lip gloss. I don't need all that other paraphenalia. These are products that work for me and I can let go of all that other stuff knowing that from here on out I'll use up what I already have, and I'll buy only what I need, when I need it. This is what I discarded. This fits easily into our bathroom cabinet and when packing for a trip I can just throw it into my carrying bag. Easy peasy. I really believe I kept all that other makeup out of guilt; feeling if I had made the purchase, I needed to hold on to it. That's just silly. I've learned from my mistakes and I can move on knowing I'll make wiser decisions going forward. Oh, I did find in my before pile a nail file and comb that will go to homes of their own within our cottage. This is part of organizing like items in one place. I am feeling so good about even the smallest decluttering I accomplish. Somehow it's energizing and it inspires me to do more. It's actually a joyful undertaking. 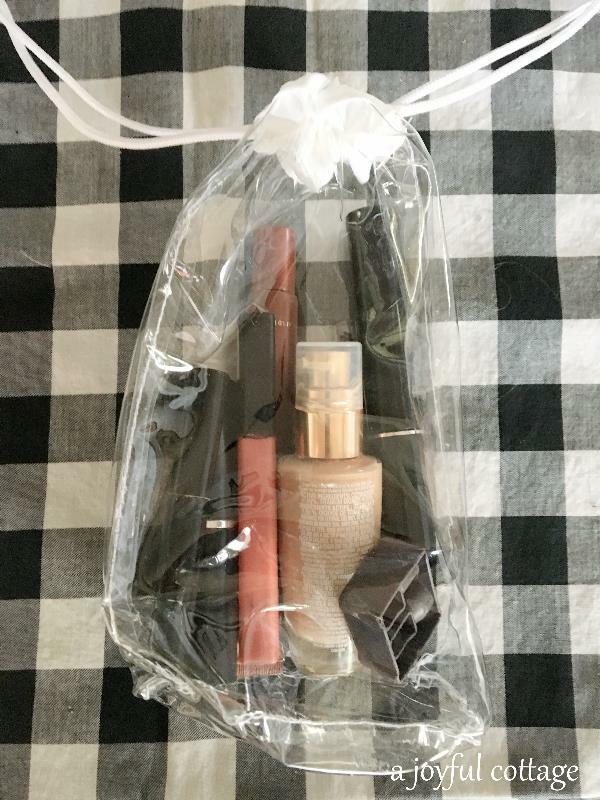 The bag your dentist gave you was made to order for your cosmetics. Glad to see the decluttering is progressing well in your house: I need to concentrate more on what I really need. .
As for decluttering, I have been doing so myself. I am on a get rid of DVDs that are not may few favorites and I will have just a few romantic and Nicholas Sparks romance saved for sick days in bed and wanting soft comfort. Way to much clutter gathers up in magazines as well, so I have donated to friends stacks of all my magazines but a very few that truly inspire a soulful touching of my heart. Love that you have inspired my day to get going and clean out the junk inside and out getting ready for spring and summer. Who need so much stuff anyways ? early last month i did an initial toss of makeup and am now finding that i'm using even less than what i kept after the toss. so. this month you've inspired me to do another toss, keeping that which truly works and i actually use. tossing the rest. i've done the magazines .. and like dore from burlap luxe, am needing to go through dvd's. i did a quick sifting of titles and came away with more than a few, wondering why i ever wanted them in my collection in the first place! I especially like the use of that see-through bag. Very smart! Snow. Ugh. We're supposed to have some on Friday. Meanwhile there was a thunderstorm today. Moody weather is right. I have teenage girls and their make up collections are...abundant. I will say that they are very organized though. Of course, we had to buy things to contain it all. I'm like you. One small bag in my vanity drawer with a few essentials. I also had tons of items I was too guilty to get rid of, but after five years, they weren't good anyway, I am sure. It feels good to clean up and clean out. :) Ps- I hope you get some spring sooner than later! OK, I have to say that my heart stopped when you said you got rid of some magazines. I LOVE MAGAZINES! No, I think I'm obsessed with them! Then you went to your makeup! Eeek! I understand about the guilt about keeping it. You have done a great job on purging, de-cluttering and organizing. We have no more snow. Let Spring begin! you're inspiring to clear out the old make-up that doesn't function for you. I have been thinking about your statement that we keep things out of guilt. Bingo! I'm going to pitch stuff by remembering that statement. Energizing is a great word for what it can feel like when sorting out, down sizing, decluttering. Precisely what I feel . . . a cleansing of sorts . 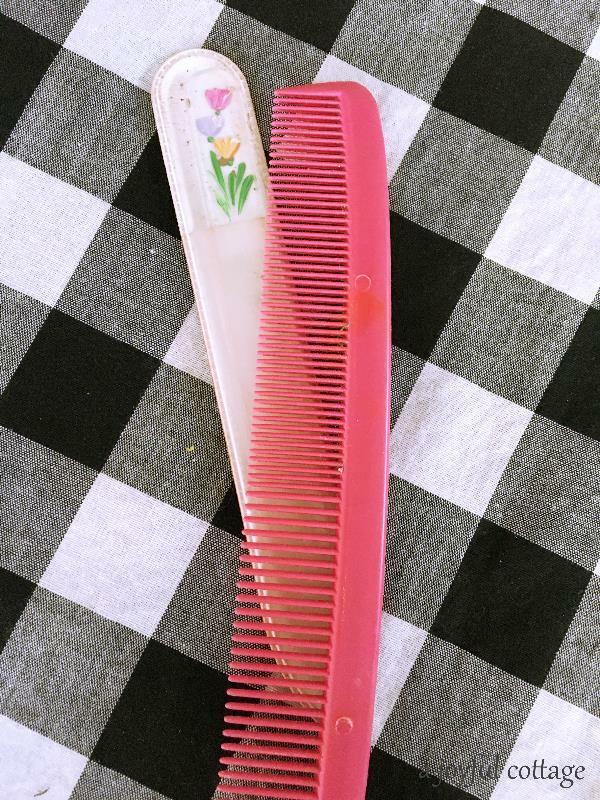 . .
Amazing how many items can accumulate in the strangest places. Even in a makeup bag. The rug weaving looks wonderful. I love the refreshing colors and pattern.. 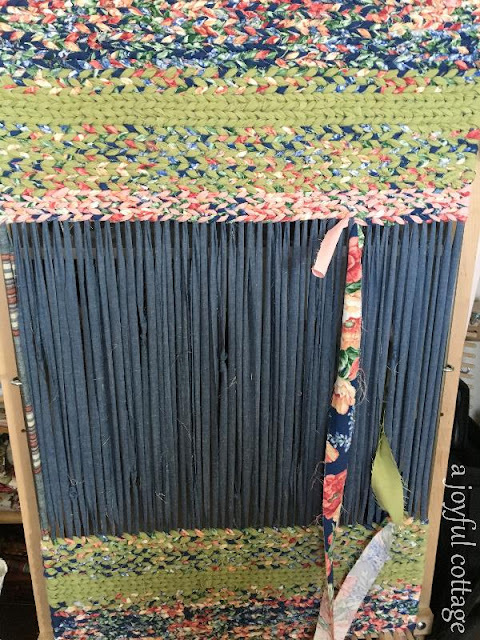 I can imagine it is quite pleasant to work on the weaving in the midst of your decluttering goal. I like your community artisan plans, sounds like it will be received with enthusiasm. And the snow, then melt, then snow, then melt again routine is happening here too. With spring bulbs opening and showing themselves in the midst. Springtime is certainly trying to show its presence. I'm loving your decluttering posts, Nancy. They are inspirational. I say that and yet, as I unpacked the last 4 boxes of my dishes today, washed and put them in cupboards, not a single dish did I put aside for a yard sale or whatever. I did give away so many when we moved last April and I do think about in a year or two trying to winnow down more until I get to what I use all the time. But I'm not quite there yet. Timing is everything, right? You are decluttering quite a bit. I bet that feels so great. We had tornados and thunderstorms in Illinois yesterday and today we are getting snow. This weather is so crazy! Have a great rest of the week Nancy. The rug you are weaving is going to be a work of art, Nancy! How ambitious of you to organize an art fair. I used to host boutiques in my home back in my painting days, and they're a lot of work, but so much fun, too. It's a great way to meet fellow artisans. 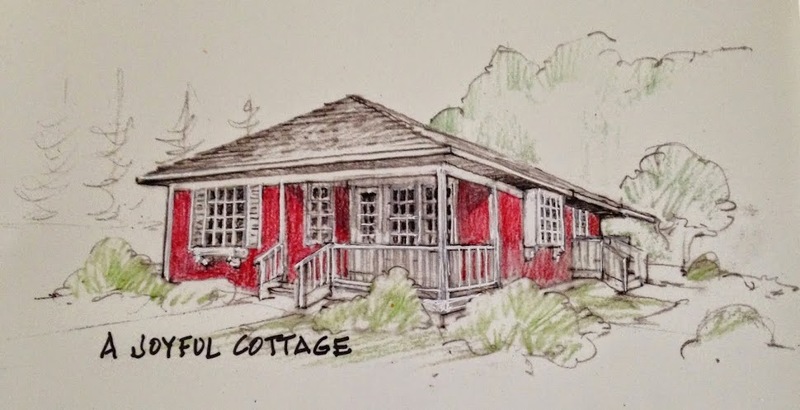 I recycle my paperback books to our library and my magazines to a friend with a lake cabin. They make for great reading on a rainy weekend at the lake. I need to tackle my make-up drawer. I probably have stuff from a decade ago! 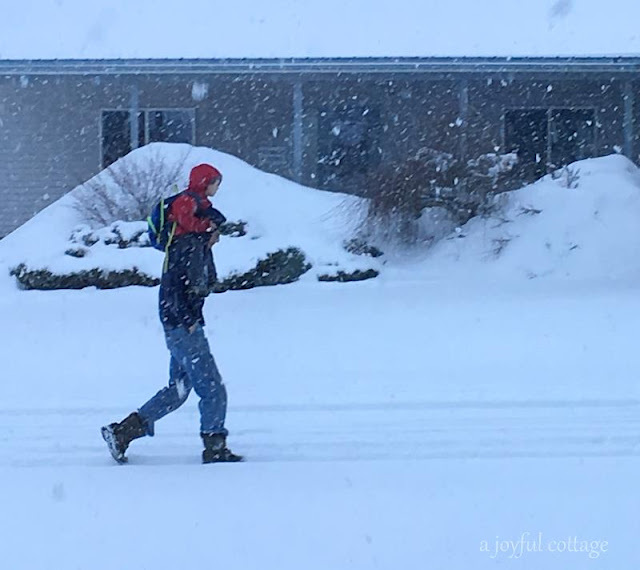 Our March came in like a lamb, so I suppose that means snow at the end of the month. How wonderful to see your flowers poking through the snow already! You've done it again! You inspired me to sort through my makeup again - and you gave me the idea my brain has been searching for. In the past I've kept skincare and makeup supplies in our bathroom, in the big trailer and in my little vintage trailer so they would be handy wherever I go. Maybe my dentist will give me a little bag like yours - or I'll have to make one! Your decluttering continues to inspire me. I have so much to do now that I'm also dealing with my dear mother's cute, little house filled with treasures. Good for you, Nancy! Again, I did this a while back in my bathroom closet, my upstairs space and in the kitchen! NOW....I just need to do this to my satchel that I use for school and I'm ready! I love to purge - and need to do it more often...isn't it amazing what we hold onto? Your rug is gorgeous!! Good for you! You're really on a roll. I'm in the process too and it could easily be a full time job! Funny you mentioned the paper sorting -- I went to start that and said, "Nope!" Thanks for coming by The Marmelade Gypsy -- I'm so delighted to have discovered your blog. I also decluttered my makeup box and discarded the stuff I no longer use. 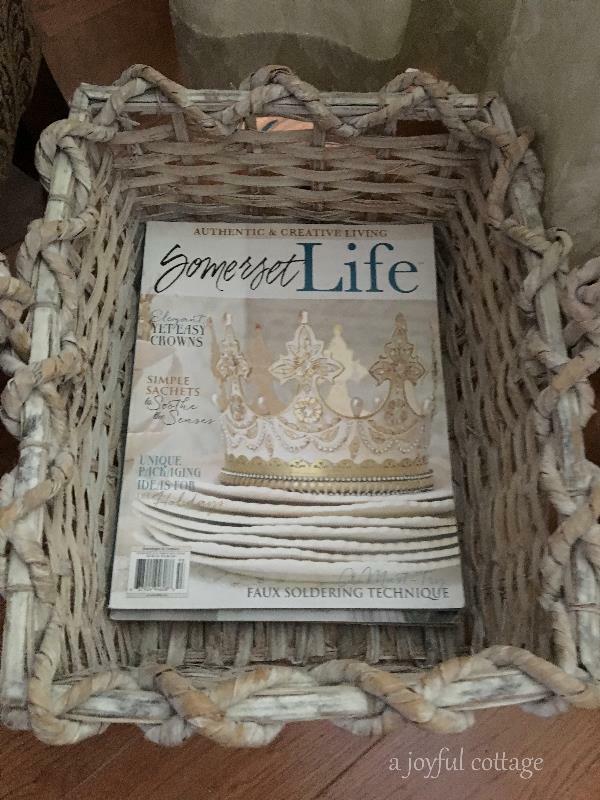 I also gave away all my decorating magazines and books. I am kinda grieving getting rid of the books. Another enjoyable and motivating post! I can't wait to hear about your adventure with the papers. Whau, making your own rug is pretty impressive. I am pretty good about not buying a lot of make up products. I used to get more years ago but we have lived in tiny rural towns that I usually ask myself why to use make up at all. So a natural country lady it is. Thanks for sharing Nancy! I had to chuckle. 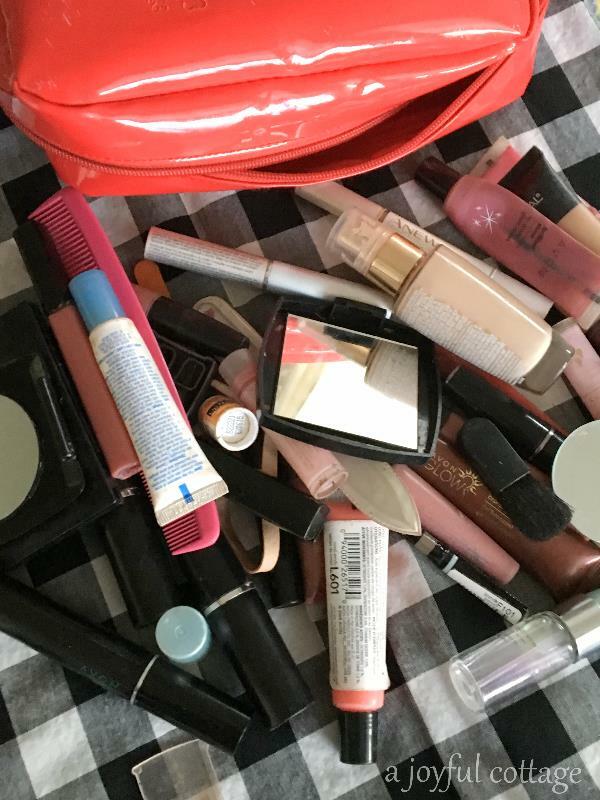 I cleaned out my make up bag in February. ;-) I did the same as you. I also think I held on to the stuff for the same reason. In case you do not hear from me, know that I will return and your blog friendship is special to me. Well, you got a lot of snow this winter, glad to see it moving along! We have more snow supposed to come in... but I look forward to spring, it must surely come, the days are getting longer! Your loom is amazing, what a joy it must be to craft such a beautiful rug! And I need to organize my bathroom drawers too. You have inspired me! This winter has certainly kept us all guessing with the temperatures going up and down on a regular basis. You are a master declutterer, Nancy! I agree that cleaning out the smallest of places gives such a feeling of accomplishment. Like you I keep make-up to a minimum, but I do have a little collection of nail polish for my toe nails in summer!